Patrons learn to play ukulele at the Boulevard Park Library. 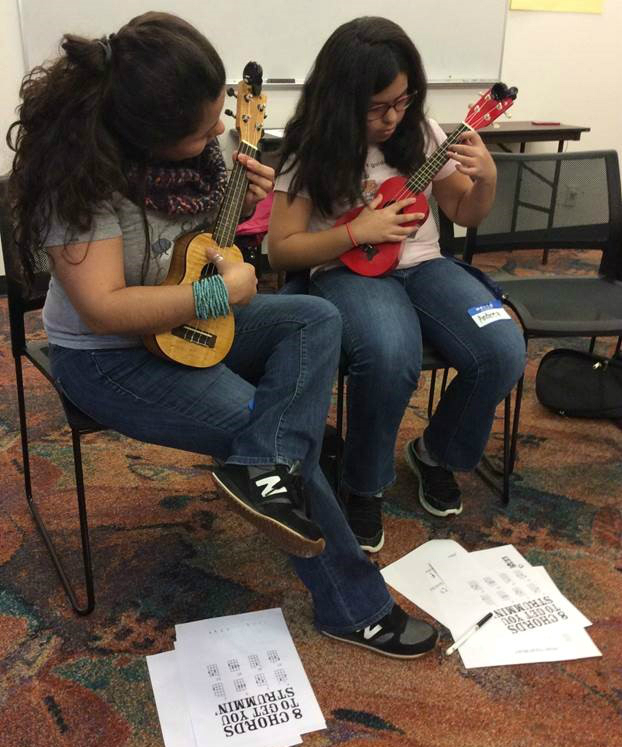 At the library, you can attend a class or ukulele jam to learn basic ukulele skills. Be sure to check whether the program has loaner ukes available or if its BYOU (Bring Your Own Ukulele). Log in to Lynda.com with your library card number and password to watch the Beginning Ukulele class with musician Daniel Ho. These short instructional videos teach the fundamentals of the instrument from the basics to more advanced techniques. Read Ukulele Magazine online to learn more about the world of ukulele music and pick up tips on playing. Visit DoctorUke.com for a wealth of resources, particularly the Beginners page or the list of thousands of songs. Follow the lessons at Uke School to work your way through learning the ukulele. Use Riffstation (online or with an iOS app) to learn the chords for popular songs synced up with their music videos (available for guitar and piano too!). Check out one of these books to teach yourself to play the ukulele at home or improve your skills.